Despite having similar names and a similar reliance on electricity, the Chevy Bolt and Volt are not at all the same car. To highlight the differences between these two vehicles, we compared them across several categories, allowing us to get a feel for the technology and features driving each model. Bolt, Volt. Chevrolet’s two electrified models sound a lot alike but they’re completely different cars. The Bolt is an all-electric car, meaning it does not run on gasoline and relies exclusively on electricity to move forward. Now in its second generation, the Volt is a plug-in hybrid car equipped with a four-cylinder engine that takes over when the battery runs out of electricity. If you’re not sure which one to choose, read on for our Chevy Bolt vs. Volt comparison highlighting design, technology, performance, and safety. An electric car is, by definition, a high-tech vehicle. To that end, even the base version of the Bolt comes with a 10.2-inch touchscreen integrated in the dashboard, Bluetooth connectivity, and Android Auto/Apple CarPlay compatibility. Music plays through a six-speaker sound system. Chevrolet also bundles in a 4G LTE connection, though it’s only active if users pay extra for a data plan, and Chevrolet Connected Access, which gives the driver access to an array of useful information including vehicle diagnostics and dealer maintenance notifications. The Volt offers the same level of standard equipment, though its touchscreen is a smaller eight-inch unit. In terms of tech features, both models stand proud near the top of their respective segments. All electric, the Bolt uses a 60-kWh lithium-ion battery pack and a 150-kW motor. In more familiar terms, the hatchback produces 200 horsepower and 266 pound-feet of torque. Its 3,580-pound weight makes it rather portly for a compact car, though it’s on the lighter side of the spectrum for an electric car. Chevrolet quotes a range of up to 238 miles but your mileage will vary depending on how you drive, where you live, and what you routinely carry. 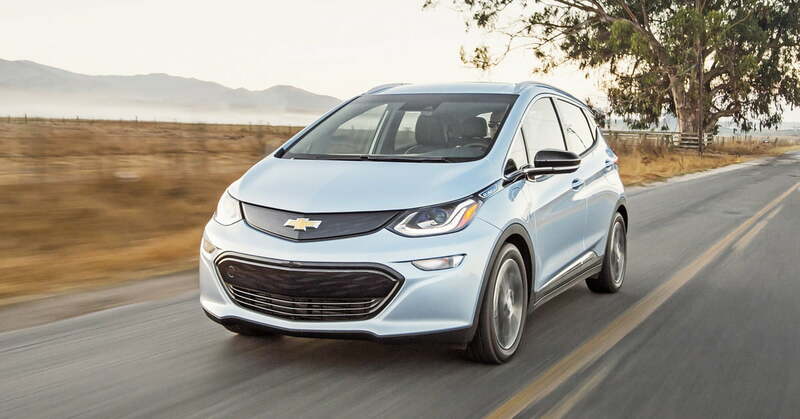 Chevrolet quotes a range of up to 238 miles in the all-electric Bolt but your mileage will vary depending on how you drive, where you live, and what you routinely carry. The hybrid Volt provides a useful 420-mile range before needing to fill up or stop for a charge. Charging times are ballpark estimates, too. Chevrolet says a full charge takes approximately nine hours when using a 240-volt home charger but about 24 hours when the Bolt draws electricity at the rate of four drivable miles per hour through a standard 120-volt outlet. Fast-charging stations can zap the battery pack with about 90 miles of range in 30 minutes. The main part of the Volt’s plug-in hybrid drivetrain consists of a pair of electric motors that jointly deliver 149 hp and 294 lb-ft. of torque to the front wheels. They draw electricity from a 18.4-kWh lithium-ion battery pack that stores enough juice to power the car for up to 53 miles. If your commute is shorter than that, you could theoretically never have to put gasoline in it. Thanks for reading about Chevy Bolt vs. Volt. For additional information please contact our Customer Care Team at 630-898-9630 or visit our website.